This savory chicken dish has just the right amount of sweet. Preheat oven to 375 degrees F. Grease a baking dish with butter and set aside. Place 2 tablespoons of the butter in a medium skillet over medium high heat. Add leeks, thyme, salt and pepper and cook, stirring occasionally, until lightly golden, about 5 minutes. Transfer to a medium bowl. Add cornbread and toss to combine. Set aside. Place a strainer over a small saucepan. Pour strawberry mixture into strainer, pressing firmly with a wooden spoon to drain excess liquid. Return 3/4 cup of strawberries to liquid in saucepan. Reserve remaining strawberries. Add chicken broth to saucepan. Bring to a boil over high heat. Reduce heat so that liquid doesn’t boil over, and let simmer vigorously until mixture is reduced and thick, about 30 minutes. Remove from heat and set aside. Meanwhile, cut a horizontal pocket into each chicken breast. 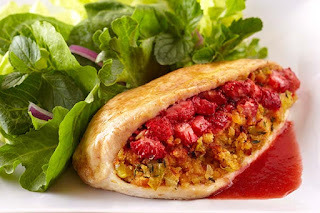 Fill pockets with stuffing mixture. Place reserved strawberries on top of stuffing. Spread remaining butter over top of chicken. Sprinkle lightly with salt and pepper and place in prepared baking dish. Bake for 20 minutes, or until cooked through. Strain sauce and spoon over chicken. Serve immediately. This looks AMAZING! Thanks for linking up with us at #BloggersSpotlight! Please link up again next week!